It was just last month that speculation ran rampant that some of Microsoft’s exclusive indie games could be making their way over to the Switch. Among the rumored games were Ori and the Blind Forest and Cuphead. Well, we can now confirm that the latter is making the jump to the Switch next month! Cuphead will arrive on April 18 and feature the same insanely detailed graphics and animation that gamers fell in love with on the Xbox One. The eShop title will be $19.99 and it supports 2 player co-op local play as well! Will you be picking this one up on the Switch? Since the launch of our little cartoon adventure, we’ve been floored by the warmth and support from our players. From heartfelt letters to amazing artwork, our fans across Xbox and PC have been the best we could’ve asked for and we’re excited to bring even more fans into the Cuphead community. So we’re thrilled to announce that on April 18th our pugilistic platformer Cuphead is indeed coming to Nintendo Switch™! Pickup and play solo on the go, grab a friend and play co-op with two Joy-Cons™, or dock your Switch and experience all the thrills from the comfort of your living room. The choice is yours! You can pre-purchase starting today on the Nintendo eShop. At the same time, we’ll be working closely with the lovely team at Microsoft to investigate bringing Xbox Live features to the Nintendo Switch version of Cuphead. It’s still early days, so we can’t promise any dates or details on this, but we’ll be tinkering away to see what’s possible in the coming months! CHARACTER SELECTION! For the first time ever, select Mugman right from the start of your adventure in single player! FULLY ANIMATED CINEMATICS! Now, all of the game’s cutscenes play out in fabulous locomotion! FULLY LOCALIZED TEXT IN TEN ADDITIONAL LANGUAGES! In addition to English, we’re thrilled to be able to offer Cuphead in French, Italian, German, Spanish, Brazilian Portuguese, Polish, Russian, Japanese, Korean, and Simplified Chinese. We know how long folks have been waiting for this, so we took special care in the quality of each translation, and curated fonts that felt just right for each audience. In fact, we even partnered with expert calligraphers to bring the Boss & Level title lettering to life in Korean, Chinese, and Japanese – drawing inspiration from the early cartoon works of each country! OODLES OF BRAND NEW ANIMATION AND ART! Cuphead and Mugman have multiple fight intros! Legendary Chalice now grants Super Arts with a blast of magical energy! Mummies explode in a shower of confetti! Dozens of other dazzling additions and adjustments throughout the game! 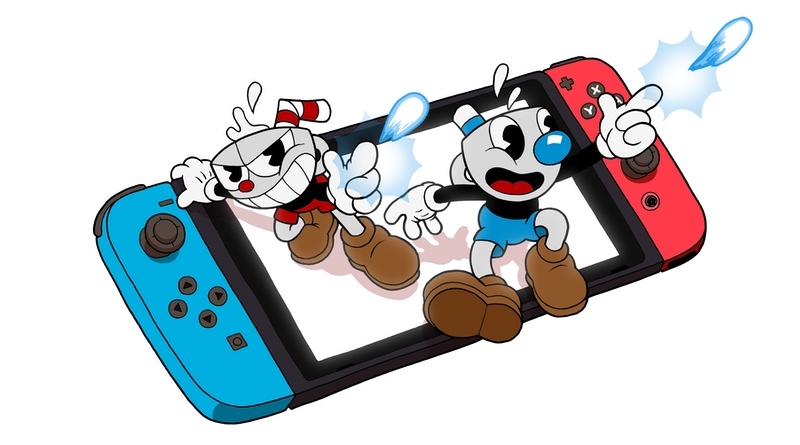 As a reminder, all of this piping hot new content is coming bundled with the Nintendo Switch release, and will be available as a FREE patch on April 18th to everyone who owns Cuphead on any platform. So whether you plan to explore the Inkwell Isles for the very first time on Nintendo Switch, or revisit them again as Mugman in a new language, we hope you enjoy a swell battle!